Asus has unveiled the latest ultra-netbook at the top end of its massively successful Eee PC line, with a notably bigger screen and better keyboard to satisfy even the most fat-fingered couch surfers. 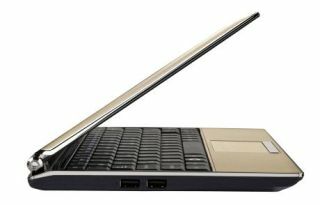 The Asus Eee PC S121 is a worthy successor to the S101 and is sure to become one of the most covetable netbooks on the market when it is made available early in 2009. We should have more details from CES next week, but in the meantime we can tell you a little more about the spec – the 'netbook of champions' rocks the standard Intel Atom CPU, 1GB RAM and offers a choice of XP or Linux OS. So much, so 'meh'... But when you consider that it also packs in Wi-Fi-N connectivity, a superb 12.1" screen, hybrid SSD/HDD storage (offering long battery life and better overall performance) and a full-sized keyboard, then you begin to realise how well Asus has honed the netbook, since the original cheap and cheerful mini Eee PCs that were designed for school children. We even quite like the choice of brown styling, which really makes the machine stand out from the mass of black or white (or red or pink) options elsewhere. Expect pricing and more details from CES next week. For now, check pics over on Newlaunches.com.